Although publications in recent years have been paying closer attention to diversity, gender stereotypes related to race are still apparent in the pages of U.S. magazines, according to a recent interdisciplinary study conducted by William & Mary faculty and student researchers. Led by Professors Joanna Schug and Monika Gosin, the researchers examined photos in six popular, American magazines and found that Asian men and black women were underrepresented, potentially due to stereotypes that associate femininity with Asian people and masculinity with black people. The study is the first to show that not only are black women rendered “invisible” in media depictions, but Asian men are, too, said Schug, an assistant professor of psychology. “I think we’re showing evidence of gender-based stereotypes on a cultural level and not just a psychological level,” she said. The study, “Gendered race in mass media: Invisibility of Asian men and Black women in popular magazines,” was published online by the journal Psychology of Popular Media Culture on Aug. 24. Along with Schug and Gosin, it was coauthored by Nicholas Alt, a graduate student in psychology at W&M; Jennifer Fay, a 2015 graduate of W&M; and Philip Lu, a graduate student in sociology at the University of California, Los Angeles. The idea for the study originally came from research that was done on interracial dating and marriage, which found that, statistically, “black women and Asian men are generally not the preferred partner in interracial couples,” said Gosin, assistant professor of sociology. For instance, added Schug, couples with black men and white women are much more common than couples with white men and black women, and marriages between Asian women and white men are much more common than those between Asian men and white women. “The effect is even more pronounced for Asian and black couples, which are much more likely to be between an Asian woman and a black man,” Schug said. As Schug considered those findings, she began paying attention to depictions of black women and Asian men in the media and decided to reach out to Gosin, who teaches classes on race and media and media and society. “I needed an expert who knows about media studies and knows about research on intersectionality, and so she brought in a lot of citations from Asian-American studies, which I had no idea about, and it just kind of blew my mind away that there’s all this research that had been done,” said Schug. Armed with that knowledge, Schug gathered a group of undergraduate students to begin the study. Led by Fay, the students coded all of the faces that appeared in five issues each of GQ and Vogue (fashion magazines), Men’s Health and Women’s Health (fitness), and Maxim and Cosmopolitan (sexual themes). The faces were coded as for perceived gender (male and female) and perceived race in the categories of East Asian, black, white or other. Altogether, the students coded 8,124 individuals in the 30 magazine issues. 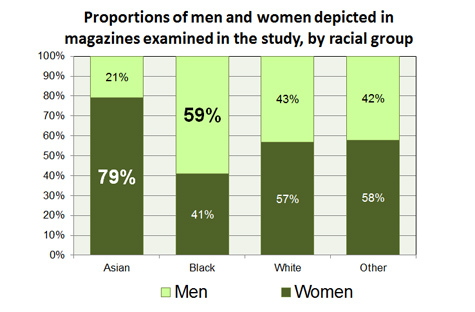 Controlling for magazine type, the results were the same, meaning that black women and Asian men were again underrepresented proportionally regardless of the genre of the publication. The researchers also found many more women in women’s magazines and more men in men’s magazines, with the exception of Maxim, a leading men’s lifestyle magazine known for its annual “Hot 100” list of women. “With Asian masculinity not being represented, it kind of gives the message that Asian men are not as masculine as the men who are represented, and similar with black women,” said Gosin. The study builds on previous research conducted by Schug and published in The Journal of Experimental Social Psychology earlier this year. In one part of that study, Schug showed that, as in previous studies with black women, people (in this case, a group of non-Asian undergraduates) were less likely to remember statements made by Asian men. In another study, 326 people (including male, female and black, white and Asian participants) were asked to write a short story about a typical college senior taking a trip. Overall, participants were more likely to create a male character. Asked to create a black character, the participants often thought of a man, and, asked to think of an Asian character, they were more likely to think of a woman, compared to people who wrote about a white character. Both of Schug’s studies align with the theories of gendered race and intersectional invisibility, the professors said. Intersectional invisibility is the tendency for people who have overlapping marginalized identities to regularly get ignored, said Schug. For instance, she added, black women, who belong to two marginalized groups, were often overlooked both during the civil rights movement – which focused more on black men – and the feminist movement – which centered mostly on white women. Gendered race theory, which is primarily based on research focused on the United States, is a more recent idea that says that people can have “stereotypes about stereotypes,” Schug said. Although Asian men, being male, may not necessarily belong to two marginalized identities as defined by intersectional invisibility, gendered race theory shows that they may still be rendered invisible because of the gender stereotype attached to their race, making them non-prototypical. “Asian-American scholarship has pointed out that they don’t benefit from male privilege in the same ways as white men because there’s a stereotype that their maleness is not enough, that they are more feminine,” said Gosin. The stereotypes regarding Asian men and black women that the researchers found reflected in their study have roots in centuries-old power struggles, said Gosin. Although people in the United States – including those in the media business – are now making an effort to pay more attention to diversity, they are not likely paying attention to intersectionality, said Schug. “So they say, ‘We have a black person. We have an Asian person here. We have the colors represented.’ But they’re not looking at subtle things that matter in terms of these intersections,” said Gosin. 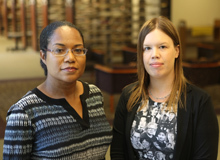 The researchers hope that their study will help bring to light the topics of intersectionality and gendered race, even as they continue to explore it. One question that was raised by the study, they said, was how these media depictions impact self-image. “So do Asian men suffer because of this? Do black women suffer because of the fact that they’re not represented in the media? What does that look like today?” said Gosin. Whatever the next step, the two professors look forward to continuing to work together across disciplines.